This disc might be entitled Homage to Rohan de Saram. The pieces he performs here showcase the three sides of his musical personality and career: strong ability with classic cello works, advocacy for new music and adeptness with the forms of the music of his own Sri Lankan heritage. All are performed with the commitment and attention to detail typical of this performer. Pfitzner’s Cello Concerto No. 1 was written in 1935 and shares little of the angst of the Violin Concerto or the Symphony Op. 46. It is a mixture of the pastoral and the energetic. De Saram brings out both these qualities. He produces a beautiful sound while paying close attention to the rhythmic elements of the piece and is quite moving in the central development section as well the final restatement of the main theme at the work’s conclusion. The overall performance is extremely well thought out, but passionate at the same time: de Saram specialities. John Mayer was born sixty years after Pfitzner to an Anglo-Indian family in Calcutta. Though he spent most of his career in Birmingham, the music of India permeates his works, making him an ideal collaborator with Rohan de Saram both in composition and performance. 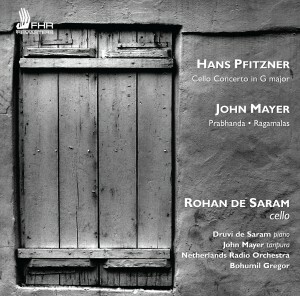 Of the two Mayer works recorded here, Prabhanda is the more interesting. It combines the forms of raga sections with a modern, but lyrical twentieth century classical idiom. Unlike so many blends of eastern and western music, the whole really is more than the sum of the parts: this is music that is integrated and expressive without in any way being artificial. In this piece de Saram’s rhythmic abilities are to the fore and he is ably backed up by his brother Druvi. The Six Ragamalas are each based on the notes of a specific raga, which also has a pictorial connotation. Here the cello is accompanied by the tanpura, a lute-like instrument. While numbers four and especially six are very impressive, the overall set lacked the force of the Prabhanda pieces. De Saram’s playing is notable for his differentiation of the moods of the six pieces and John Mayer’s playing cannot be faulted. The Mayer recordings have all appeared before in various formats. The Pfitzner was originally recorded for broadcast and though more than thirty years old, is quite serviceable though the soloist was placed too close to the microphone. The Netherlands Radio Orchestra under Bohumil Gregor plays with a lot of warmth. The recording quality of the Mayer pieces is a little rough-and -ready but does not detract from the music. Given de Saram’s wide repertoire, it’s a shame he did not record Pfitzner’s other two cello concertos as his performance here is the equal of David Geringas’s on the latter’s complete set on CPO.